A lack of co-enzyme Q10 has been associated with periodental (gum) disease. Similarly it has been shown that heart patients and the obese tend to have low co-enzyme Q10 levels. Co-enzyme Q10 is found in foods, particularly organ meat, but cooking and processing methods have a tendency to destroy it and, whilst it can be made in the body, production declines as we age. In fact, a lack of energy in older people may, in part, be connected with lower co-enzyme Q10 production in the body. As with all nutrients absorption is of prime importance. 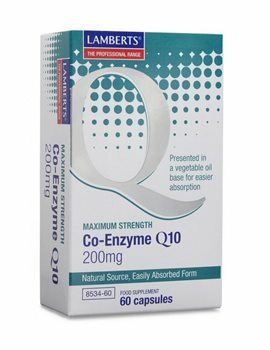 Lamberts Maximum Strength Co-Enzyme Q10 200mg is presented in a vegetable oil base for faster absorption and is endorsed by one of the original researchers who first discovered Co-Enzyme Q10. As well as its unsurpassable quality, it is one of the most potent products on the market. Co-Enzyme Q10 - 200mg (Ubiquinone).